Super Mario Bros is 25 years old this year. Let that soak in. Ready to continue? 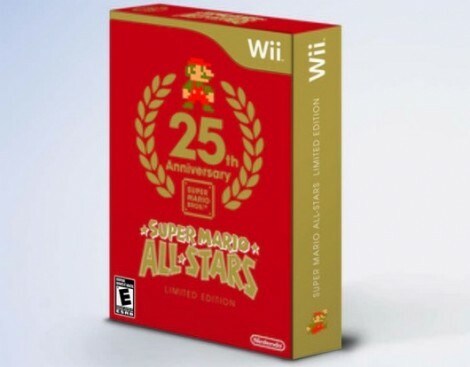 Nintendo plans to keep on celebrating the game that started it all by releasing a $30 Limited Edition of Super Mario All-Stars for the Wii. The game includes the classic Super Mario All-Stars collection of Super Mario Bros 1-3 plus The Lost Levels that was available on the SNES. In addition to the games, there will be a Super Mario History soundtrack CD and 32-page art booklet. Even though we all have our own ideas of what else they should include (*cough* supermarioworld *cough*) it sounds like a pretty solid package for a Super Mario super fan. If the contents alone weren’t enough to convince you check out the just released image of the box art. Doesn’t get more classic than that. The Super Mario All-Stars: Limited Edition will hit U.S. stores just before the holidays on Dec 12.